Company arriving shortly, and you haven’t prepared any apps? 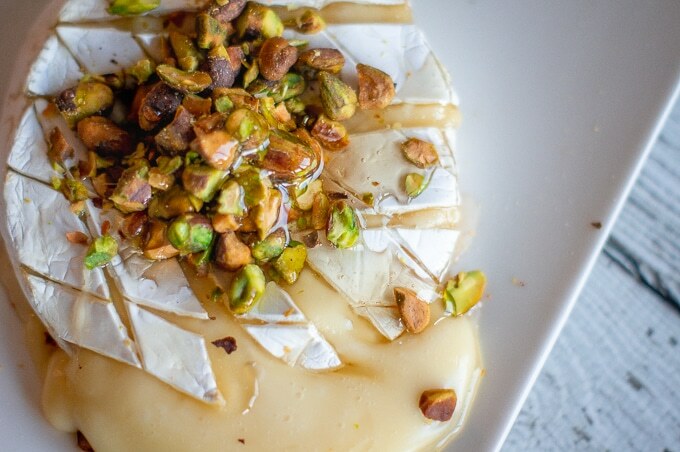 This Baked Brie with Honey and Crushed Pistachios is the answer. 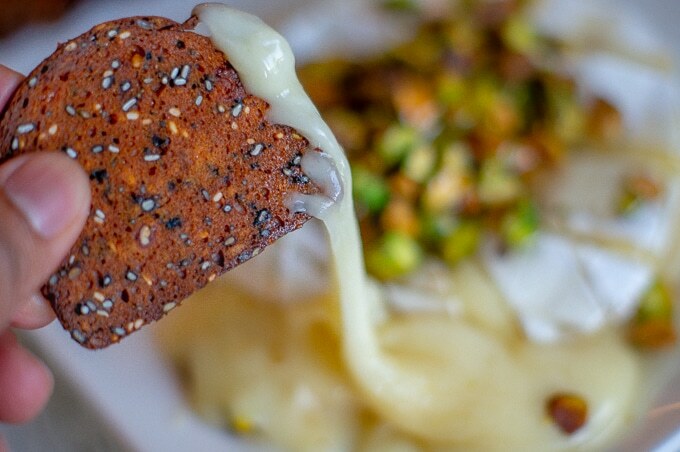 Think about it – savoury brie softened just enough to meld perfectly into the sweetness of honey. Delicious. 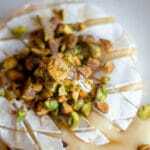 And then you add the texture of crushed pistachios on top, just to take it up another notch! You’re probably wondering how this works. 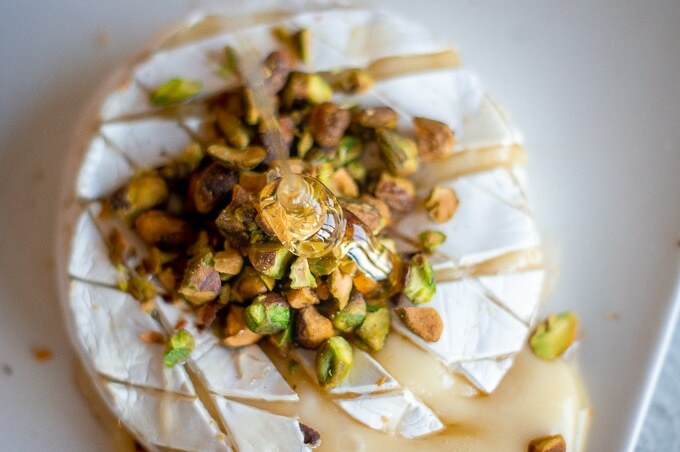 It can’t possibly be as simple a wheel of brie, warmed until molten, with honey drizzled, and pistachios sprinkled on top. Can it? Yes. Yes, it can. I honestly don’t know who first thought up the idea of baking brie with honey. It’s such a simple thing, but the honey just brings out such a wonderful depth of flavour. So, drizzle on that honey, honey! I can call you “honey”, can’t I? What else would I call someone as sweet as you? Okay, you’re right. It’s weird. Baked Brie with Honey…and really, most, just about, any nut works, actually. The heading above kinda says it all, bestie. Don’t shy away if pistachios aren’t your thing, or in case you happen to have almonds at home. Most nuts will work fairly well in this recipe. In fact, I had originally planned to write this as a Baked Brie with Honey and Pine Nuts recipe…but ultimately, I felt that the higher price tag of pine nuts doesn’t really add enough to this recipe. I’ve tried it with almonds slivers, and coarsely chopped honey-roasted peanuts…both were fantastic. And while we’re talking about substitutions, you can absolutely swap out the honey with agave syrup or pure maple syrup for some fun variations. In this post, I use these Kii Naturals Crisps with Apricot, Orange and Almonds (Heads up! This is an affiliate link.). You don’t need to use a super fancy/expensive wheel of brie. In fact, younger brie (as opposed to that artisanal aged stuff) has a more delicately-flavoured rind. The rind from an aged brie will taste much stronger…possibly, overpoweringly so! Double or triple-cream brie will melt best when baked! No special tools required here. But I do recommend you check out my Shop page, there are a whole bunch of cooking essentials there for you! 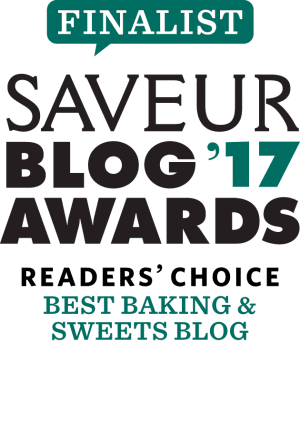 And for a little extra reading, I highly recommend checking out this guide on How to Read a Recipe Post (Properly). Very little effort, great results! That’s what this baked appetiser recipe was all about. If you tried it, please do comment below and let me know what you thought! Or tell me what other variations you use! Don’t forget to follow me on Facebook, Pinterest, Instagram and Twitter. Or just sign up to be a part of my mailing list. 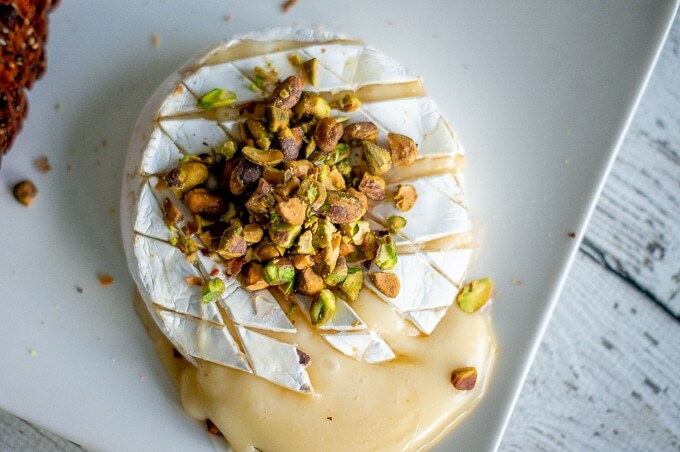 Baked Brie with Honey and Crushed Pistachios is all about maximum results with minimum effort in very little time! Try it. You’ll see. Place the brie into a baking dish, and drizzle with honey. Bake for 15-20 minutes, or until the brie begins to ooze. Remove from oven. Sprinkle with the crushed pistachios. Drizzle on the honey . That’s it, you’re ready to serve! Pro Tip – The baked brie is ready once it begins to ooze, don’t wait until it melts completely and loses shape! Pro Tip – You can serve this alongside a range of items, but crackers, or sourdough are an easy place to start if you’re at a loss for ideas. Pro Tip – You can soften the brie even faster by by placing it in the microwave on 50 % power and heating in 30 second intervals until you achieve the desired level of meltedness (don’t overheat or you will end up with brie soup and a tough rind!). Fancier Rosemary Honey Version: Put the honey in a small saucepan, add a sprig of fresh rosemary and gently simmer for 5 minutes. Pour that over the brie. YUM! 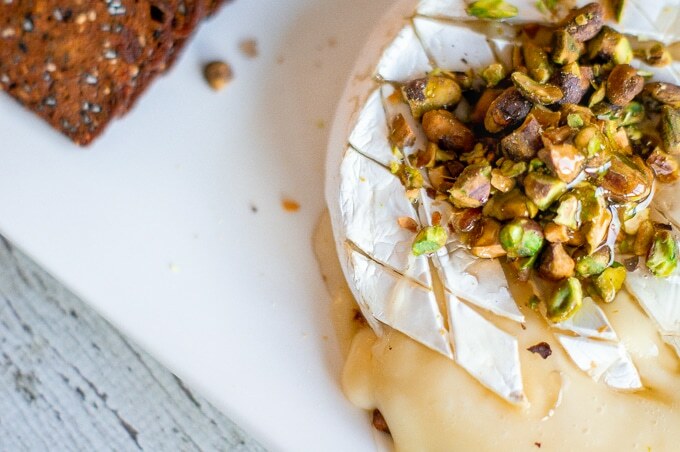 Oh man, I love brie and I don’t think you can go wrong by adding pistachios and honey to it. Perfect for holidays or super bowl! Oh man, that brie looks amazing! 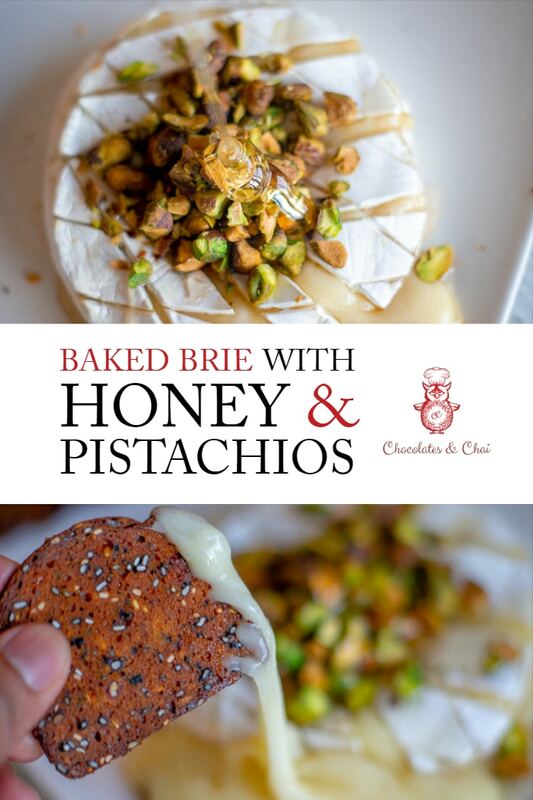 I don’t think you can go wrong by adding pistachios and honey to it. Perfect for holidays or super bowl! Love that it’s a spin off the more traditional brie with cranberry and pecans and such that you see over the holidays a lot. This combination sounds divine. Hi Kristen! Thanks very much! Cranberries and pecans is definitely another delicious way to go! There are too many droolicious photos on this post. I can’t handle it! Superb combo of flavours and who can resist melted brie? Certainly not I! Oh. My. Gosh. All that oozy brie topped with that delicious honey and nuts. I’m in. Can we just eat this all the time? Thank you. LOL! I like the way you think, Jo….shall we go for a melted brie breakfast, lunch and dinner? My father used to put honey on cheddar cheese, so this makes sense to me. I love baked brie and great recipes for entertaining that are easy to put together! Thank you for finding a lower-priced nut than pine nuts. Oh, I’ve never tried honey on cheddar. But I do have some cheddar cheese sitting in the fridge so I think I’ll add that to my breakfast tomorrow! Thanks Cathy (+C’s dad) for the idea! Wow, looks so fancy with hardly any effort! I totally love that! Added to my must try list. Hey Farwin, thanks very much! I hope you enjoy it! This looks absolutely delicious and luscious, Riz! What a treat to share with a group of friends over wine and chatter. Thanks for sharing. Thanks for passing by, Denise!! I agree, this is something that’s best when shared!